We’ve been waiting for this – The 2010 Tropical season is heating up. As the transition from the El Niño to La Niña winds down we expected the Atlantic hurricane season to pick up. This was what all of the hurricane experts were predicting. 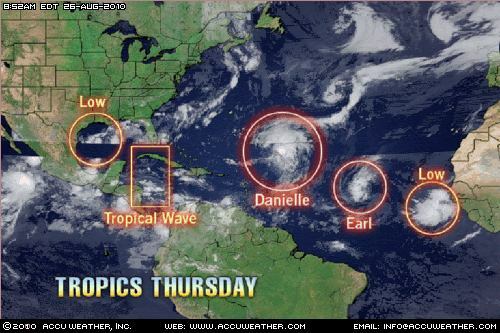 Currently there is 1 hurricane (Danielle), 1 Tropical Storm (Earl) and 2 others that are being closely watched. Hurricane Danielle is expected to turn more to the north by the weekend bringing the storm very close to Bermuda on Sunday. Though the eye is expected to remain east of Bermuda, the island will be heavily impacted by this strong hurricane. Danielle is expected to reach Category 3 intensity before the weekend. 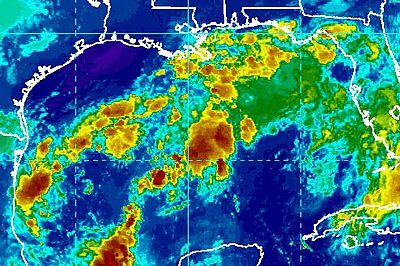 As with Danielle, Tropical Storm Earl is not forecast to be a threat to the U.S. 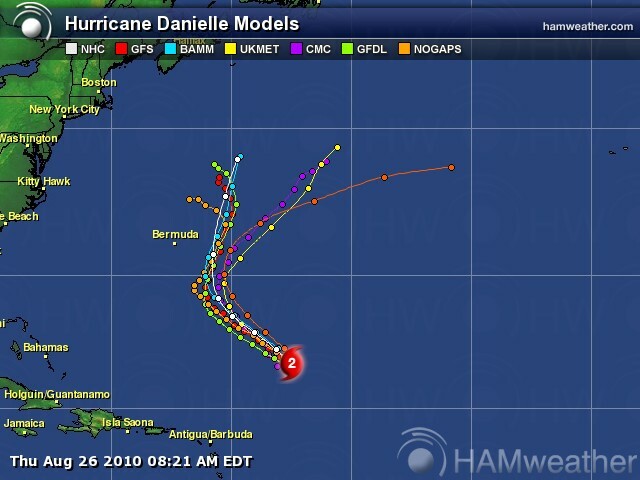 The same weakness that Hurricane Danielle found that has her turning toward Bermuda is expected to remain long enough for Earl to follow the similar path. 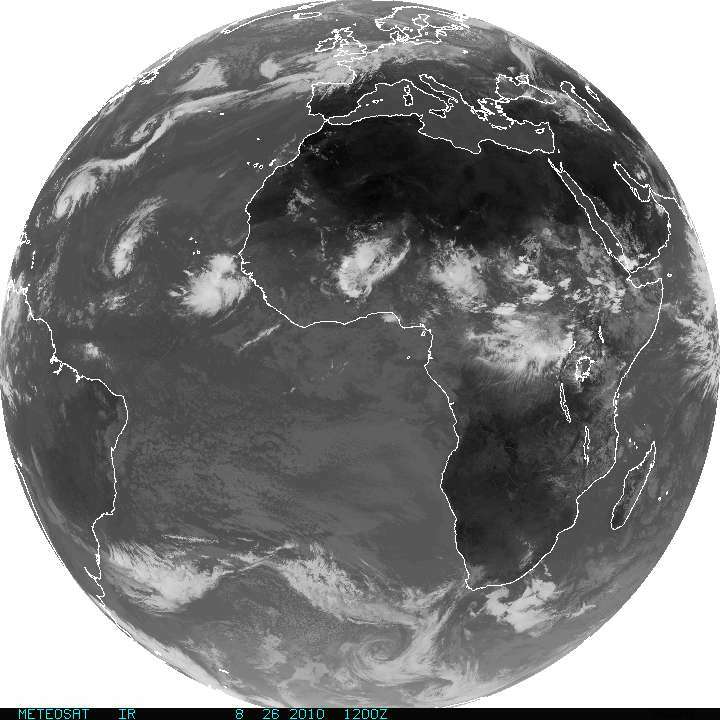 There is a strong looking system just west of the coast of Africa that is expected to strengthen to storm status and a system brewing in the Gulf of Mexico. One of these is expected to become Tropical Storm Fiona over the next few days. Tropical Storm Danny is still poorly organized though it is expected to strengthen into a hurricane. As of 5am EDT on Thursday, Danny is located near 27.4 north, 72.1 west or about 575 miles south-southeast of Hatteras, North Carolina. Maximum sustained wins are near 60 mph with gusts up to 70 mph. It is moving northwest at 10 mph. Tropical Storm Danny’s central pressure is 1006 millibars or 29.71 inches. Satellite images indicate that most of the storms deep convection is on the eastern side of the storm. The center of Danny has re-formed a little farther to the north. As Danny moves father away from the weak upper-level low that had been creating shear, thus preventing Danny from becoming better organized, the storm should now gradually strengthen over the next 24-48 hours. Tropical Storm Claudette made landfall early Monday morning near Fort Walton Beach, Florida. It was located near 30.9 north and 87.0 west or about 40 miles northwest of Fort Walton Beach. Claudette has sustained winds of 40 mph and is heading northwest at 12 mph. Estimated central pressure is 1006 millibars or 29.71 inches. TD 4 intensified Sunday into Tropical Storm Claudette. It is located around 40 miles South – Southwest of Apalachicola, Florida. Maximum sustained winds remain at 50 mph with higher gusts. Claudette is moving to the Northwest at 14 mph. A Tropical Storm Warning remains in effect from the Alabama / Florida border eastward to the Suwannee River in Florida. Bill is now projected to possibly become the season’s first major hurricane later this week. 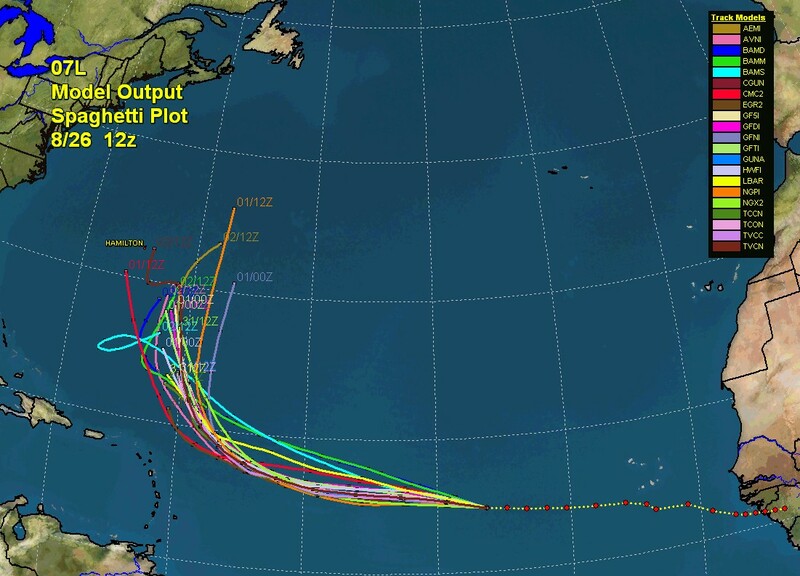 Projections also now indicate a more northerly track and a possible movement away from the U.S. coastline. Ana weakened into a tropical depression on Sunday as it moved closer to the Caribbean Islands. At 5 p.m. EDT Sunday, a tropical storm watch is in effect for the Dominican Republic from Cabo Engano westward to Cabo Beata. A tropical Storm watch remains in effect for Puerto Rico, The U.S. Virgin islands, Montserrat, Antigua, Barbuda, St. Kitts, Nevis, Anguilla, St. Maarten, St. Martin, Saba, St. Eustatius, Guadeloupe and St. Barthelemy. For spaghetti models – see post from earlier today. The 2009 Hurricane season was very quiet until late in the week as 3 systems formed – 2 in the Atlantic and 1 in the Gulf of Mexico. The first storm of the hurricane season typically forms around the middle of August so there really are no surprises this year. Remember, in 1992, Hurricane Andrew formed on August 16th. Hurricane Ike is bearing down on the Texas coast as a large category 2 storm. Ike could still increase to category 3 strength today. Hurricane Ike is in the Gulf of Mexico heading toward Texas. The storm is expected to make landfall early Saturday as a very strong hurricane, possibly as strong as a Category 4. Jeff Greene with a double-digit lead in the polls? Is Florida insane? What’s next for Charlie Crist?